While on my way to work, I was driving down US-50 yesterday, listening to my books on tape (A Dangerous Mourning by Anne Perry). 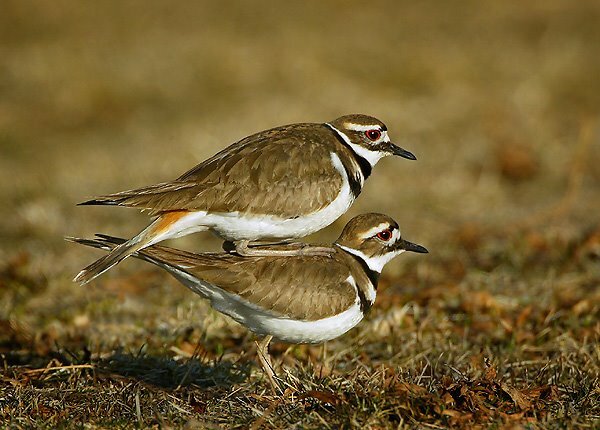 I glanced out my window and was surprised to see a pair of kildeer frolicking in the field next to the highway, not 30 feet from the roadside. The spot was not a particularly picturesque spot along the highway. The birds were in an open field of a sod farm, located in a rather industrial section of the county sandwiched between gas stations, a large truck junkyard, and a rock quarry. But the birds didn't seem to care. They were enjoying the newly planted grass and crisp sunny morning. It was cool to see them, as I don't often see kildeers around my home. The last and only other time I saw a kildeer was at the boys' school in the field across from the parking lot last year.